40 plus Healthcare Services a Gujarat based Healthcare Company launched one nation one card to provide best medical care to the people. It’s a loyalty card which gives benefit to the holder for getting various medical and Para medical services at economical cost. The health Card called PHOENIX HEALTH CARD which will connect the public from Birth till Demise with the Best Medical Service Providers this city has to offer. PHOENIX health card is a Highly Advance QR Coded. High Index, Pre Numbered , to be Activated Card which is linked with PHOENIXHEALTHCARD Website and Mobile App. PHOENIX Card will Provide Excellent Medical and Paramedical Services at Select locations where a person can take advantage of free Consultations and Discounted throughout the year . PHOENIX HEALTH CARD is for Individual use only with a Validity of One Year. 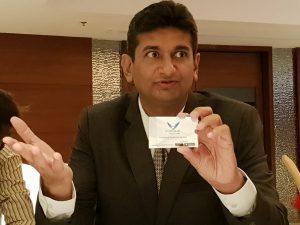 “The health card gives the benefit of Rs.250 free voucher ( TWO COUPONS ) for blood reports at pathology lab, Free 1st Consultation or check up at more than 20 leading medical consultants, Free 1st Consulting for all the other Paramedical Services like Physiotherapy, Acupuncture, Psychological counseling, Magnetic therapy, Yoga. 10 % Discount on Doctors Hospitalization Indoor Billing except for Medical Insurance Policy users throughout the year, 10 % Discount on the Medicines at Chemist Stores for as many times at selected stores, 10% Discount on all Radiological investigations like X-Rays, Sonography, MRI , CTScan at Radiology Centers , throughout the year, 10 % Discount on Laboratory Reports at Select Labs, 20 % Discount on Medical Equipments at Select Stores, 15 % Discount on Select Optic Shops, 15 to 20% Discount On Annual Membership On Select Gyms,” said founder Dr. Niketan Shah. The card is launched from Vadodara and they are targeting Anand as their next destination. Next they will try to include more doctors and services and target to benefit around 25,000 people in the inaugural year. My name is Ramesh Whabi. Please let me know if this card is also usable in Mumbai. I and my wife are residing in Dubai but visit Mumbai since we have an apartment there.